The polar vortex is upon us. It has vacated its home and is currently rampaging across the continent like a bull in a china shop, knocking out powerlines and shutting down roads and railways. WIthout a system to trap the cold currents in near the Arctic, it's all spilling south, feeding the frost. Like a door left open to the frigid air outside. We can't camp in this weather. We can't cycle in this weather. Nor can we wait it out. 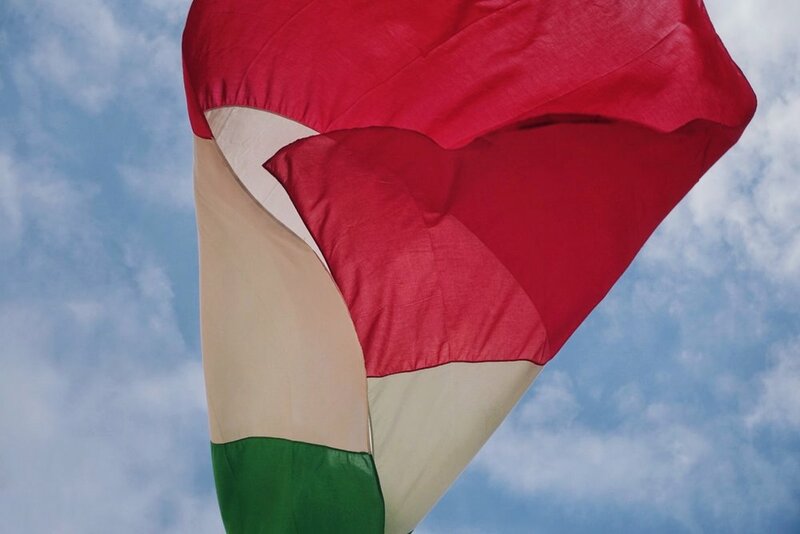 Italy is both expensive and an integral part of the European Union's Schengen Area. We're allowed just ninety days in that region, a large bloc containing all of western Europe, some of eastern Europe, and a few odds and ends like Iceland and Greece. No extensions, no renewals until another ninety days have elapsed. We have used more than sixty of those days, and this storm may not wear itself out and go home for another two weeks. Cycling across Italy includes over seven hundred kilometers and one big climb of well over a thousand meters, at least a week or two of riding for us on in the best of conditions. And these are not the best of conditions. Mountain passes are sure to be snowed in. Roads will be covered in the stuff. And even when the polar vortex abates, it'll take time to clean things up. Until then, impassable asphalt. Slush. Black ice and drivers in way over their heads. Danger and discomfort. Even if we somehow manage to zip across Italy, blaze a path through the snow banks and the iced-over bike trails, we'll use up almost every last day of our Schengen allowance. That means Greece, if it's somewhere we'd like to pass through later on, will be off-limits. We'd really like to leave our options open. So we discuss and deliberate and decide. Lauren's mother has an old friend on the other side of Italy, near Trieste. She's agreed to take us in and give us shelter from the storm. She has space and she has heat. We'll be comfortable and we'll be safe. All we have to do is get there. Traveling on a bicycle is a beautiful thing. You can ride it great distances. You can ride it across countries and you can ride it across continents. You can huff up one side of a high pass and zip down the other, coasting for dozens of kilometers without a single pedal stroke or drop of gasoline. And when the going gets tough, when the road is blocked or bumpy, you can pick the thing up over your head and just carry it to smoother surfaces. Generally, you move at your schedule and at your pace. Traveling with a bicycle is something altogether less liberating. A train is by its very nature a very regimented form of transport. A train has schedules: always fixed, mostly firm. It is dichotomous: you are either on the train or you are off the train. It is confining: you cannot stop when you see a pretty vista outside the window. You stop when the train stops. You move at one speed: the speed of the train. I spent three months riding the rails around Europe a few years back. I fell in love with trains. I bought an unlimited rail pass for ninety days, jammed the few things I had into a small messenger bag, and made the coach my home. I'd walk into a train station, look at the clickity-clackity flipboard overhead, and step aboard whatever train was headed to the most alluring destination. If I disembarked at the destination and found it less alluring than I'd anticipated, I'd hop right back on another. With just a canvas sack slung over my shoulder and an all-access pass in my pocket, it was easy living. But now I have a bicycle. We both do. They are big and bulky and dirty and don't make great seatmates on a crowded railcar. There are rules and regulations governing where they can go and where they can't. On a crowded weekend like this one, when everyone is rushing home before the big storm makes rushing home impossible, we are left with few options to cross Italy with our bicycles. Our journey—just five hours and direct were we to ride the high-speed, no-bikes-allowed InterCity—will take all day and feature three transfers. It will leave at 4:50AM tomorrow and arrive in Trieste sometime in the evening. Bikes, we think, are okay. We think. Because we do not speak Italian, and the website contradicts itself all over. We arrive in Ventimiglia and prepare to board. It's 4:50PM, give or take, so we actually prepare to board for about twelve hours. We head to a McDonald's that's open until midnight and stay there until midnight. We return to the train station in the wee hours of the morning and wait the final few hours in the frigid open-air entryway. We should probably have gotten a room somewhere. It would have been more comfortable. But on the rare occasions we pay for lodging (we've done so just three nights in western Europe, all back in Barcelona), we like to make the most of it. We like to check in as early as we can, lie in bed for about eighteen hours, and leave late in the morning. Busting our budget for a few hours of shut-eye seems like a waste. But now it's 2AM and freezing and there's an obnoxious adolescent lurking around and asking for one of the apples we're carrying in our food jugs. "Hey, give me that apple," he demands. "No," we say. "Get your own apple." "Oh, come on. I just want one apple." He reaches toward the jug of food strapped to the fork of my bike. "Get your hands away from our bikes," I growl sternly, as I lie on the cold floor with jackets zipped up to my nose. He slinks away, muttering. There are beautiful moments on a trip like this. Glorious, thrilling descents into indescribably gorgeous valleys. Heart-melting gestures of goodwill by superbly kind people. The privilege of waking up on an any-day-of-the-week morning and doing whatever we want, of not having filed a memo or attended a meeting or touched a desktop computer for the better part of a year. But there are many moments like this one, too. Uncomfortable and unending. Painful. I try to capture them as often as I can, usually in the form of a melodramatic cliffhanger or rambling complaint. Because it's not all fun and adventure. A life on the road, living on a bare-bones budget, is occasionally a drag. Sure it's wonderful at times. And sure, to me, it's worth persevering through the doldrums. It's a life I want to be living right now. It's a life that makes me happy. But sometimes, it's a life of sleeping on a cold dirty train station floor while a shifty guy with a hackeysack tries to bully you into giving up one of your last few apples. The first train is fine. It arrives and we find the bike carriage, way up front. It's spacious and hassle-free. We doze off as it carries us through the mountains and into the plains. The second train is less fine. We get off in Milan and wait an hour or two for it to arrive, and when it does we crowd the carriages along with everyone else. We find some space and I stand my bike on its back wheel to make more room for fellow passengers. Everyone fits, and the doors close. It's a packed train. The seats are all taken and aisles are blocked. A pair of police officers squeeze through and stop next to us. They ask if we've gotten permission to have these bikes on board. Well, yes. I say. I show them our bike supplements, a seven-euro surcharge to our tickets that guarantees safe passage for our bicycles along all four legs of this journey. Right, that's fine, they reply. But this is a very full train. You need permission from the conductor to bring the bikes on. Uh, okay. Where's the conductor?, I ask. They shrug. They point to the masses behind me as they head off in the other direction. I go to find the conductor. I don't find the conductor. I wade through a dense river of tightly-packed bodies in search of a generic someone. Mi scusi, mi scusi. I push by people and try not to step on toes and ultimately come to rest a complete blockade, suitcases piled high. They can't say I didn't try. I wander back through the aisles and stand pressed against Lauren, our bikes digging into our sides, for another ninety minutes. The third train is the one I'm most worried about. It's an international train. The first two trains were regional, and regional trains admit bikes just fine (assuming they're not too crowded). But the Trenitalia website had a special clause about the third train. No, bikes aren't usually allowed on international trains. But this particular line is an exception. Our train is delayed, so I take the time to ask around the station. Yes, hello, can I verify that when this train pulls up and bodies rush toward it, us and our bikes won't be denied? I wind up at a ticket window with a woman who speaks only marginally more English than I speak Italian. "This international train. No bicycle on international train. " Right, but the website. I slide my phone underneath the thick, scratched glass and ask her to read the page I've downloaded. The website's banner matches the one on her shirt. She looks at it. Nods. Looks up. "Website is wrong. No bicycle on international train." I ask what my options are. I ask about exchanging our tickets—expensive, and bought on the website under the assumption that staff would honor the words on the site—for a regional train the rest of the way. "No exchange. Tickets not refundable. You must pay extra." Right, but the website. I ask why we have to pay for a second set of tickets when the website made it sound like we'd be okay with the first set. She looks at me blankly. "Train coming soon." She's right. Both trains are coming. The international one that we have tickets for, and shortly thereafter the regional one that we don't. "Okay, um," I hesitate, "I think maybe we'll just try to get on the international one, okay? And if that doesn't work, I'll be back for the regional tickets. We're just going to try." You know, get a second opinion about the whole we-don't-go-by-the-website approach to running a company. "No, do not try. Do not try. Buy regional ticket." "Okay," I reply, slowly backing away. "I'll just ... be right back." "Do not try!" She yells through the thick glass. "Do not try!" But I'm already out the door. Her shouts are drowned out by the deafening roar of an oncoming international train. I rush to the platform to meet Lauren and we run with our bikes alongside the slowing train. Carriage 5, Carriage 5. We scan the numbers on the side of each train car. We hurry toward it. A man in a Trenitalia uniform stops us and asks where we're going. Carriage 5, kind sir. With the bikes? Why yes. Here's our bike supplement. But bikes are not allowed on this train, he says. But your website says bikes are allowed on this train, we say. It's a tense moment. I think back to the last time we bailed out with our bikes, a cold, snowy night in the Spanish interior. A bus station. A bus. A bus driver telling us no, he's leaving us and our bikes at the station. Rising and pleading. Por favor, senor. Un momento. We plead. The train screeches to a halt. He winces and relents. Okay, okay, go. We reach the door of Carriage 5 and heave our bikes up, probably pulling a few ligaments in the process. Don't stop, don't stop. A different man in the same uniform rushes over. No bikes! he calls. Already got permission, already got permission. We surge forward and push them into the narrow corridor. Once we're fully on the train and it's evident we won't be left behind, we relax. We breathe a sigh of relief as it hisses out of the station. Then we make our penance with the very unhappy conductors surrounding us. They're actually pretty sympathetic. They realize that we have tickets that we paid for and a bike supplement that promises our bikes can come along and a poorly worded clause on the Trenitalia website that does indeed grant us a right to be here. It's unorthodox, they insist, but they don't exactly have the grounds to toss us out. We promise to sit on the floor of the corridor and watch our bikes the whole trip, foregoing the plush, comfortable seats we have reserved in the next carriage. We're hassled a short while later by a custodian. He's come to clean the bathrooms an is appalled to find two bicycles in his corridor. He shouts at us in furious Italian. I look up and do my best to explain for the fourth or fifth time. Listen, guy, we've already been through this with everyone else on the train. We've gotten permission to be here. I apologize that I don't speak Italian and ask if he speaks English. He seems angrier than before that I would even dare to ask. "This is Italy!" he shouts in Italian. "This is Italy, and in Italy we speak Italian!" He says some more things we don't understand. A kind couple, amused by the custodian's escalating outbursts, helps translate between empathetic smiles. "He says you don't have his permission," they shrug. The bikes stay where they are. So it's a long day of getting yelled at holding bicycles and rushing around train stations and waiting. Our third train is late to our third transfer and we're given approximately sixty seconds to disembark, rush our bikes down a flight of stairs, run to another platform, and haul them and their dozens of kilos of luggage up another thirty or forty steps. We make our final train in the nick of time, doors thrusting shut seconds after we climb in. And then we're in Trieste. We have made it here right at the onset of the polar vortex's onslaught. We're greeted at the train station by Myrna, her son Francesc, and gale force winds. Half of the scooters and motorcycles in town have been toppled by the gusts. The storm has arrived. We settle in for a long, cold week. We do little. We rest and read and talk to Myrna. We take a day trip with her, Francesc, and his wife to Slovenia, just a few hundred meters away from their home in Muggia, and Croatia, a little further still. We visit tiny mountaintop hamlets, which seem just lovely, but it's also negative nineteen degrees and we're at the top of a mountain, so perhaps it's not the best day for the great outdoors. We meet Myrna's wonderful neighbors and are invited over for long, delicious meals. We watch Italy have an election and study how it reacts to an unexpected and largely undesirous outcome. My rim is still cracked. Has been since halfway through France. I'd tried to get a new wheel in Marseille but had no luck finding one in the right size. And then the rim manufacturer came through and said they'd cover it under warranty, which was great, so I just let the old one ride until the replacement met us in Muggia. I took precautions. I marked the edges of the crack with Sharpie to determine if it was spreading (it was, a little). I rode very slowly, avoiding any sort of gravel and braking before even the gentlest bumps. I reduced the tire pressure and watched things closely. When a rim fails, it tends to fail "catastrophically." I contacted my old bike shop in DC and asked them what that meant. They said it means the rim may just collapse, which could be deadly at high speed but not too bad if pedaling slowly enough. But it could also mean the rim splits at the crack. It could mean sending a jagged piece of aluminum whirling around on the edge of a wheel spinning dozens of times each minute. Like a wonky chopsaw whirring inches from a pair of legs, in this case my legs, knifing at the flesh. Catasrophic indeed. So, I'm eager to get this wheel fixed. The new rim, delayed about a week due to the near-complete shutdown of Europe's transportation network, finally arrives. 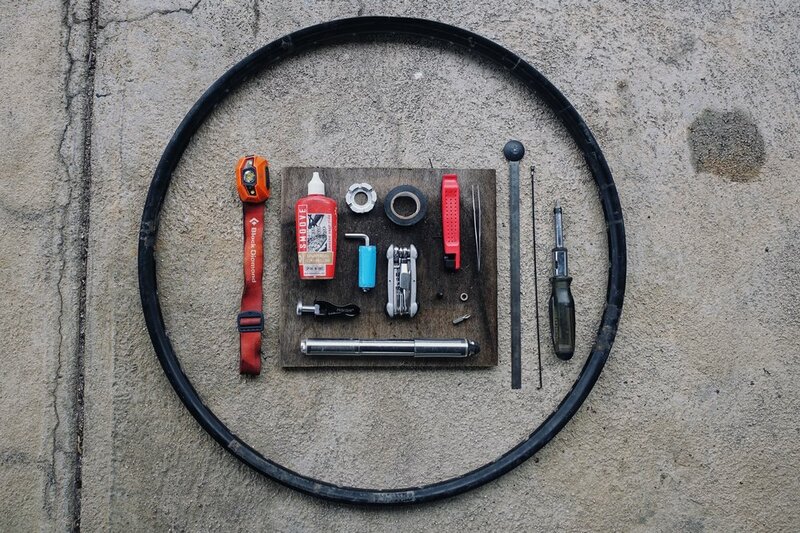 It's just the rim itself, not a complete wheel, and so I must transfer the good bits of the old wheel—old hub, old spokes, old tire and tube and rim tape—to the replacement. I know some things about bikes but I know nothing about rims and spokes and hubs. Changing tires, sure. Lacing wheels, not so much. It's complicated and intimidating. 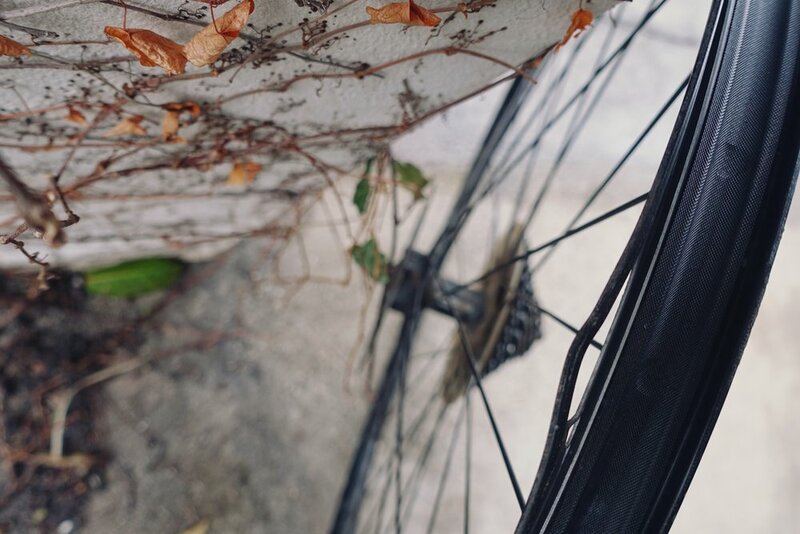 It'd cost almost a hundred euros to have it done at a bike shop, which is more or less the price of a brand new wheel, complete and ready to ride. Like so many things in the world today, it's cheaper to just buy a new one than fix the old one. But it'd cost nothing to do it myself. And I'd like to learn, anyway. So I read a little tutorial before the replacement shows up in Muggia and when it finally arrives, I get to work transferring the old bits to the new rim. I spend a slow, relaxing afternoon moving spoke-ends one by one, and by day's end I have myself a wobbly and wonky but respectable-looking wheel. The old, cracked rim lays at my feet. I eat, sleep, and straighten the wheel the following morning. I build a laughable but marginally helpful truing stand out of two jugs, two dog bowls, a little duct tape, and a few stands of uncooked spaghetti. This is Italy, after all. I spin the rear wheel and halt it where it dishes to the right and tighten the opposite spokes and try again. Eventually, it straightens. I confirm even tensioning by downloading a guitar tuning app, plucking each spoke, and watching the pitch register on my phone screen. E is very good, and B-flat is very bad. I don't get it perfect, but I get it close enough. 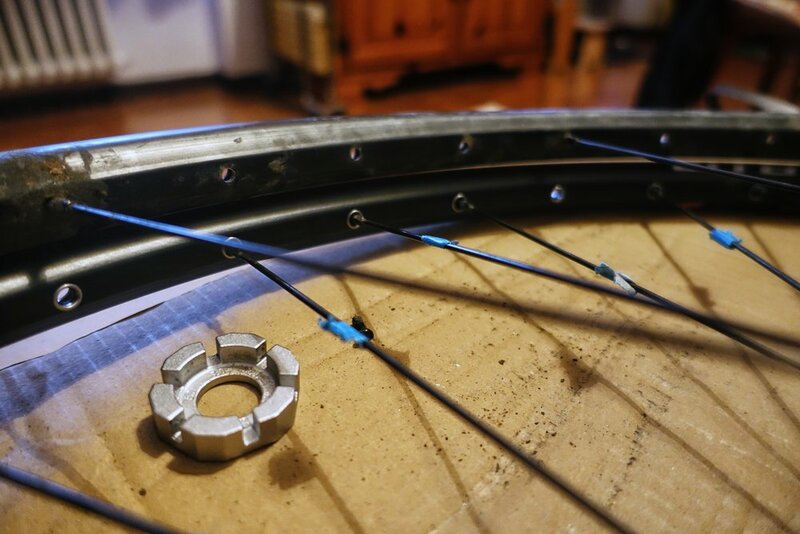 I bolt the new wheel onto my bicycle and ride it to Slovenia. It's a short ride, and unloaded, but the wheel doesn't collapse and I don't go careening into a ditch and the bike rides just fine. It's fixed, I think. I think. I hope. I will find out soon enough. I return to Italy and to Lauren and Myrna and our temporary home in Muggia. It is a warm day. Sunny. Clear skies. It feels like spring. The polar vortex is gone. It is, once more, okay to cycle. And so the next morning we wake and we pack and we thank Myrna for giving us such a warm, comfortable shelter during our extended stay in Muggia. We say goodbye to the neighbors. We strap our bags to our racks and hoist ourselves onto our saddles and push off toward Slovenia. My wheel underneath is holding my weight, for now. I pedal, carefully. Two hundred meters later, we leave Italy and enter the fractured remains of Yugoslavia.